Jennie Bell Rex departed this world into the loving arms of our Heavenly Father on Sunday, January 20, 2019, at 4:20 p.m.
She was preceded in death by her mother, Hattie Bennett, father, Buck Bennett, her husband, Grady B Rex, one great-great-grandson, Leo Vujinovic, grandson in-law, Cary Giesler, eight brothers, and five sisters. 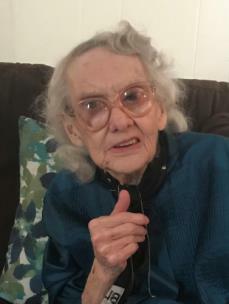 She is survived by her daughter, Joyce Russell, four granddaughters, Lisa Wooden, Donna (Rick) Holloway, Christina Giesler (Scott), Jeanie (Tim) Wallace, 10 great-grandchildren and nine great-great-grandchildren. She was dearly loved and will be truly missed. The family will receive visitors at Chattanooga Funeral Home North Chapel on Tuesday, Jan. 22, from 4-8 p.m. Services will be held on Wednesday, Jan. 23, at 1 p.m.